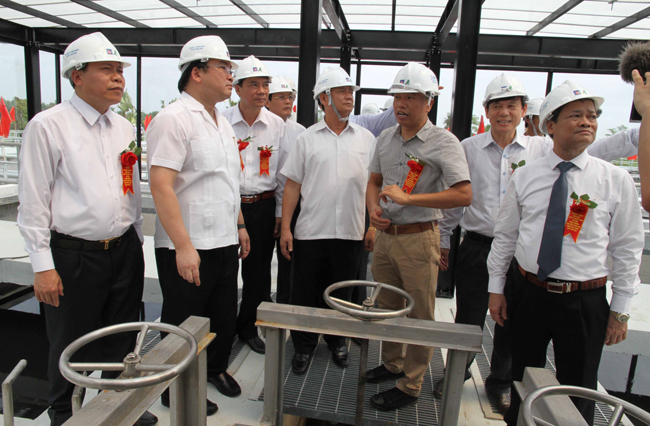 BAC NINH (VNS) — The Tu Son Town wastewater treatment plant became operational on Sunday after its construction was completed in 18 months, six months ahead of schedule. The plant is expected to help treat wastewater from the town's inner area of about 1,890ha, comprising six wards – Dong Ngan, Dinh Bang, Dong Nguyen and Tan Hong, besides Trang Ha and Chau Khe — that are home to about 100,000 people. The VND800 billion (US$ 35 million) project's first phase has been built under a build-transfer contract by the Phu Dien Construction, Investment and Trading Joint Stocks Company and the SFC Viet Nam Environment Investment and Development Joints Stock Company.